In the spring of 2016, Michole Washington became only the ninth African-American woman to graduate from the Georgia Institute of Technology with a Bachelor of Science in applied mathematics. Despite Georgia Tech’s location in Atlanta — a city with a 54 percent African-American population that proudly fosters and celebrates the educational, political and economic achievements of black people —Washington’s position in its history books is not all that surprising. Now, as a current University of Michigan student pursuing a master’s in applied mathematics and doctorate in mathematics education, Washington recently attended the Marjorie Lee Browne Colloquium, an event hosted annually by the Department of Mathematics during the university’s Martin Luther King, Jr. Symposium. Browne was U-M’s first known African-American woman to earn a doctorate in mathematics in 1950. Washington attended the event to discuss the barriers that prevent girls from underrepresented groups from excelling in math, as well as the strategies to overcome them. She said her pursuit of math spawned from the need to escape a tumultuous home environment. Women of color are still significantly underrepresented in science, technology, engineering and math (STEM) fields. According to the National Science Foundation, few women and even fewer African Americans, Latinos and Native Americans complete doctoral degrees in mathematics. And while Black, Hispanic/Latino and Native American people represent a quarter of the U.S. population, they earn less than 5 percent of the doctorate degrees in the mathematical sciences. Washington said that for progress to be made, black girls like her need the resources, support and opportunities to succeed. Suzanne L. Weekes, professor of mathematics in the Department of Mathematical Sciences at Worcester Polytechnic Institute was the keynote lecturer for the colloquium and focused her presentation on challenging the ideas of the stereotypical mathematician and creating an environment within the math community that is welcoming to diversity and inclusion. Weekes has lived out this advice by founding and co-directing the Mathematical Sciences Research Institute Undergraduate Program (MSRI-UP), a comprehensive program for undergraduates that aims to increase the number of students from underrepresented groups in mathematics graduate programs by providing research opportunities, long-term support and mentorship. During the talk, Weekes also emphasized the significance of mentorships and the development of a professional network — both elements Washington said she initially lacked. In attempt to alter that experience for a generation of black girls that will come after her, Washington created Afrithmetic, a math tutoring company. She also works to develop relationships with like-minded women such as Brittany Rhodes. 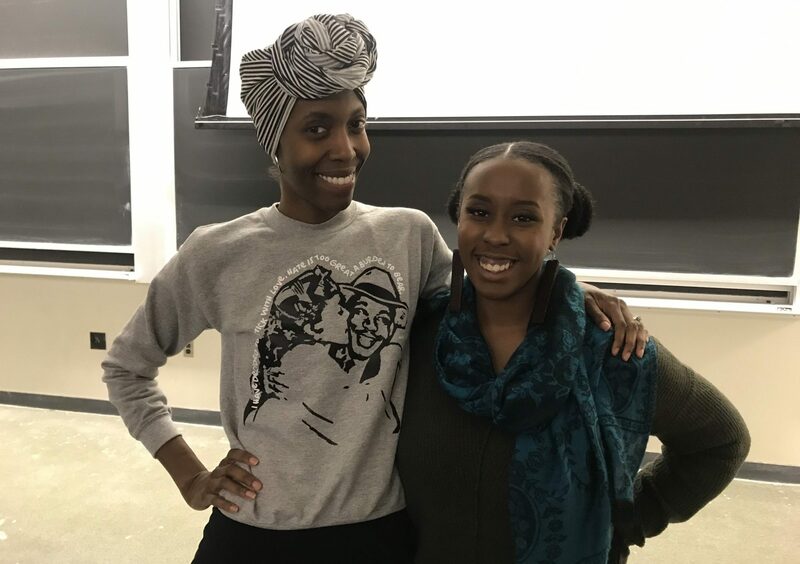 Rhodes holds a bachelor’s degree in mathematics from Spelman College and recently founded Black Girl MATHgic, the first and only monthly subscription box dedicated to inspiring math confidence and alleviating math anxiety in black girls. Rhodes and Washington connected with one another on Instagram and met in person for the first time at the colloquium. Rhodes said she created Black Girl MATHgic, which targets African-American girls ages 8-16, in an effort to increase their mathematics confidence and aptitude. Black Girl MATHgic will launch in the Spring. To track Washington’s journey to her doctorate, follow her on Instagram at @mathematichole, and to learn more about Black Girl MATHgic visit www.blackgirlmathgicbox.com.